If you want to change your body's appearance, that’s your business. But it doesn’t need to be pushed down your throat. Our culture's constant push for appearance change makes you feel like you need to “fix” yourself. It doesn’t come from a place of health. It makes you feel like there's something wrong with you. This creates a poor relationship with your exercise and your food. You look at healthy eating and exercise as a negative because it’s something you feel like you HAVE to do vs. something you GET to do. This is drudgery. And COMPLETELY CHANGES YOUR FITNESS EXPERIENCE AND YOUR LIFE. This negative relationship with exercise and food doesn’t set you up for lasting change or positive emotional health. Eventually you get sick of drudging, give up and feel like a failure. Or you go down the body obsession rabbit hole (and that becomes your new source of motivation to get through the drudgery.) Not a fun place to be. You can exercise and eat for fat loss (if that’s your goal) without hating yourself or the process. Just A simple change in your thoughts can significantly increase your chances of long-term success, happiness, and health. You want to focus on ALL the benefits exercise and healthy eating offers. In a nutshell, it’s about being able to attack life with everything you have, and absorbing every ounce of pleasure life has to offer-versus just making your way through it. You CAN’T experience everything life has to offer if you aren’t physically healthy. This view creates a much bigger and healthier picture for you to live in. But, you want to try. And sometimes all you need is some immediate gratification. You want to think about how good you will feel if you actually do it. And no, this is not a bunch of BS. Not only will you physically feel better, you will also feel better about yourself because you accomplished something-no matter how small. Not feeling like crap CAN be a powerful motivator. These feelings of wanting to “fix yourself” are so all-encompassing because women in our culture are taught to put their self-worth on their appearance and how their bodies look. Don’t get me wrong, appearances are important, but when you are placing your self-worth on it, this is where things get ugly. PLEASE re-evaluate where you are placing your self-worth. To learn more about re-directing your self-worth read: Why “The Love Your Body Movement” is Wrong. 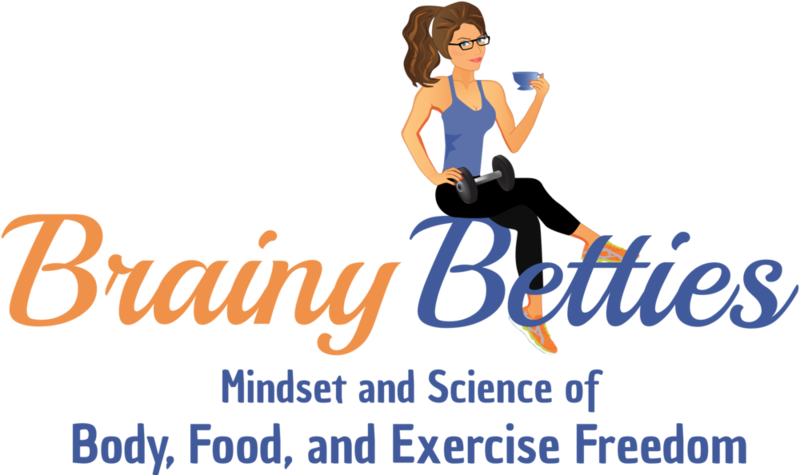 Brainy Betties helps you love your body, make fitness a positive experience, and teach you how to make it fit into your unique life. If you would like to learn more about Brainy Betties, schedule your $15 sample session today! If this article helped you, and think it could help someone you know, please share!